Hi Alan,Yes I think that's my problem getting the downloads correct,I did download that program sdr or similar name I plug the dongle into the usb port connect an aerial then move the frequency along that waterfall pattern but no audio comes in just white noise..,I know a few guys have given me some instructions but the last time I downloaded something like zadig on my computer it went hay wire.In actual fact I still have something called Delta ?? That keeps coming up on my screen..Have you bought one of those hand held radios that will receive normal digi transmissions? The problem with the handheld scanners receiving Digi, is that they are made for the American market & the Americans prefer different digi modes to us. So they work, but not on the most popular digi modes used here in the UK. heres a question for you tho what type of external connector would be needed to adapt the dongles antenna connection to an outside antennas external bnc aeriel connector etc ?? 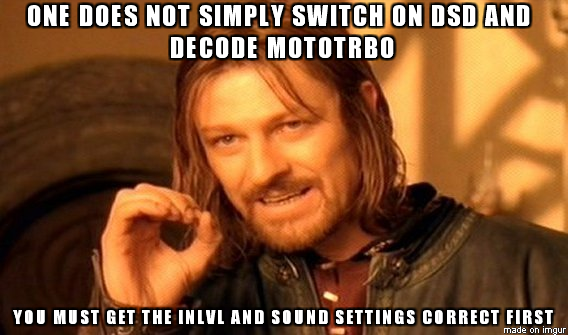 I,ve installed virtual audio cable Sammy and still it acts as if the dsd and dmr decoder aren,t getting any input from the usb dongles yet they work fine to listen to on sdr sharp program itself m8 ?? also unticked the filter box so it sees the dongle as a tap aswell . Ah this is the step where I think I got stuck at first but figured it out after a while. Then you need to install the drivers as explained here http://www.rtl-sdr.com/tag/virtual-audio-cable/ so VBC can run the audio from your SDR to DSD and then back out through your speakers. Open SDR sharp and in Audio (in the left panel) change Output to VB CABLE input and uncheck the filter audio box and it should be coming through your speaker when VOICE is happening. As you are now using DSD with SDR to adjust the inlv you need to adjust the AF Gain in SDR. On a side note after using DSD with my discriminator tap on a scanner and moving on to the cheap SDR dongle I can say 100% that the dongle's are far much better at decoding, at least in my case and it's nice to be able to get the "=" signs down to virtually zero. now its trying to decode and descramble all the garbled speech time , ive tried with adjusting the af gain slowly but no change and I set the dsd -fr switch up on dsd and the plus sign is on the left so I,m on the right tracks , on sdr sharp I,ve changed the sample rate to 48000 with the latency left at 100.
my frequency step is set at 12.5 kHz ,my filter bandwidth is set at 12500 , and my filter order is set at 400 and filter type is blackman. when I click on the configure box at the top fr filter is set as 420mhz-875m , lna enable box is ticked , mixer gain box is ticked , the if filter is set at 200 kHz , and the if gain box is at 0 and the bias t box is left unticked . if I open volume mixer box which is part of the laptops bottom right hand side I have all the gains to full ? is there anything else I,m missing do you think ?